Treasure Island is an adventure novel by Robert Louis Stevenson, narrating a tale of “buccaneers and buried gold.” Traditionally considered a coming of age story, its influence on popular lore about pirates can not be overestimated. Source: Stevenson, R. L. (1883). Treasure Island. London, England: Cassell and Co. The author dedicates the novel to a friend and, through poetry, tells the reader to read the book. Jim Hawkins starts his tale of an island. An old imposing sailor stays at Jim’s father’s inn and terrorizes the other inhabitants. He warns Jim about a one-legged sailor whom he fears and threatens Dr. Livesey with a knife. Black Dog enters the inn and asks for an old friend by the name of Billy Bones. By his description, Jim recognizes him as the old sailor staying with them. Billy tries to kill Blackl Dog with his sword and has a stroke. Dr. Livesey cares for Billy. After a glass of rum, Billy’s strength is renewed and plans to outrun his pursuers. Jim’s father dies and Jim encounters a blind man who gives Billy a pirate summons. Billy is worried and suffers a fatal stroke. Jim tells his mother about the pirate’s plan to take Billy’s sea chest and they leave town to get help, to no avail. They unlock Billy’s chest and discover gold. They take the gold and something wrapped in an oil cloth and run when they hear someone coming. Jim sees eight men running to the inn, including the blind man named Pew. They seem disappointed to find something missing from the chest. Pew orders the men to find the fugitives. When a fight breaks out, the men scatter and Pew is killed by men on horseback coming to investigate. Jim finds the inn ruined and goes to Livesey’s house. Jim, Officer Dance, and the others arrive at Livesey’s house. Jim shows him the book covered in the oil cloth. They find a log of places where loot was stolen and a map of an island where the treasure is buried. Jim and the others prepare for their journey to Treasure Island aboard the Hispaniola. Trelawney hires Long John Silver as the ship’s cook. Jim says goodbye to his mother and sets off for Bristol to meet up with Trelawney. Trelawney gives Jim a note to pass on to Long John Silver. During their meeting, he and Jim share their views on Black Dog and Pew and they become friends. Jim introduces Silver to Livesey and Livesey is pleased to have Silver as the ship’s new cook. Jim, Silver, and the others meet Mr. Arrow, the first mate, and Smollett, the Captain. Livesey declares his trust for Smollett and Silver. Mr. Arrow is discovered as a hopeless drunk and disappears one night. Job replaces him as first mate. Jim is entranced with Silver and his parrot. Jim gets hungry and climbs into a barrel for an apple. Jim overhears Silver telling some men about his adventures with Old Flint, the buccanneer. Jim learns that most of the crew on board are Flint’s old shipmates and plan to take the treasure for themselves. When the island is spotted ahead, Capt. Smollett consults his map, which Jim recognizes. Jim confides in Trelawney and Smollett Silver’s plans and Trelawney regrets his hiring of the crew. Smollett urges everyone to stay alert. After dropping anchor, Trelawney allows the men to head to the island on a diversion leaving the honest crew men to take control of the ship. Silver and the other pirates plan to look for the treasure and Jim stows away with them to spy. When he is spotted, he runs away. Silver tries to persuade another sailor named Tom to join him and his mutiny. Tom denies and Silver kills him. Jim is frightened and runs deeper into the island. Jim meets Ben Gunn. Ben tells him useful information about the lost treasure. In return for helping him with a safe passage home, Ben gives him refuge at his house. Dr. Livesey takes over the narration. He confesses his and Smollett’s concern for Jim’s safety. Livesey goes ashore and finds a stockade. He and the others load the ship with provisions. 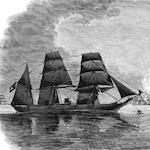 Smollett gives Abraham Gray, a sailor who was in with the mutineers, one more chance to join the good side. The small boat carrying Tom, Trelawney, Smollett, Livesey, Abraham, and the provisions is quite heavy. When a mutineer sends a cannonball at them, the ship sinks and they are forced to wade ashore. Smollett and the others wade ashore and discover a pirate they have killed. They reload their guns at the stockade. Tom is shot and they convince him that he will die nobly. They fight off gunfire from the pirates and meet up with Jim again. Jim resumes the narration again. The group escape the Union Jack as a cannonball is shot at them. Jim discovers the Jolly Roger and goes back to tell the others. Jim overhears someone saying that Silver is approaching with a truce flag. Silver introduces himself as Captain and strikes a compromise with Smollett. Silver offers cease-fire in return for the treasure map. Smollett refuses him. After Smollett refuses Silver, a battle ensues and Jim and most of the others return safely to the stockade. Livesey takes the map and goes to speak with Ben Gunn. Jim spies Silver and his men and heads for the Hispaniola. Jim cuts the anchor and sets the Hispaniola adrift. He is flung back onto the small boat and notices that he is drifting near the pirate camp. He commends his soul to God and falls asleep. Jim tries to paddle back to the Hispaniola in order to take it over. When he sees that his small boat has been destroyed, Jim realizes that he cannot escape. Aboard the Hispaniola, Jim confronts the drunken Israel Hands and declares that he is the captain. He throws the Jolly Roger flag overboard. After striking a deal, Hands agrees to help Jim steer the ship. Jim and Hands get into a fight. Jim is pinned to the mast as he shoots Hands. Jim rips free from the mast and swims to the island. He takes cover in the stockade and sees the pirates have taken over. He tries to run but is too late. Silver is amused by Jim and confides that his men are close to mutiny. He tells Jim to play the hostage to prevent his men from attacking and then tells him that Livesey has given him the map. The pirates give Silver a black spot impeaching him as the captain. Silver blames the men and gives them the map. He gives Jim the black spot as a souvenir. Livesey arrives to tend to the pirates. Livesey asks for a private meeting with Jim. Silver grants him his wish. Livesey chastises Jim for deserting the Captain. He tries to convince him that they should flee. Jim refuses. Silver thanks Jim for not running away, but Jim is worried about his future. The pirates, along with Silver and Jim, discover a skeleton pointing the way to the treasure. Nearing the treasure, the pirates hear a high voice singing the Flint’s last words. They believe it’s his ghost but continue forward. They discover the treasure missing. When the pirates begin to mutiny again, a gunshot kills several pirates and Abraham, Livesey, and Gunn emerge. Ben reveals that he found the treasure first and hid it in a cave. The group goes to where the treasure is and they rejoice in their new fortune. Jim and the others load the treasure onto the ship leaving some of the mutineers marooned on the island. Jim returns to his narration and tells the reader what happens to everyone including Silver’s disappearance with some gold. Stevenson, Robert Louis. Treasure Island. Lit2Go Edition. 1883. Web. <https://etc.usf.edu/lit2go/81/treasure-island/>. April 25, 2019. Robert Louis Stevenson, Treasure Island, Li2Go edition, (1883), accessed April 25, 2019, https://etc.usf.edu/lit2go/81/treasure-island/.